(As a reminder, you can get free, real-time crypto charts in SlopeCharts). Forty thousand dollars per bitcoin. One hundred thousand. Three hundred thousand. The predictions are as numerous as the people making them. I don’t pretend to know which one is going to be reality, and neither should anyone else. 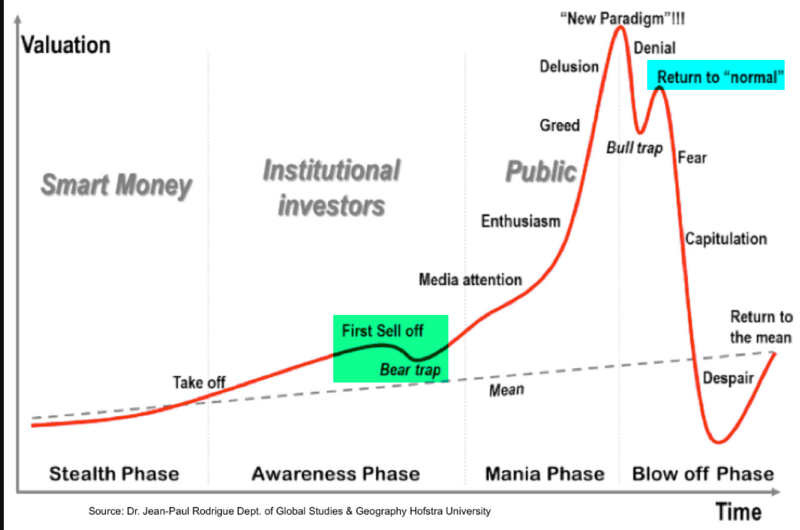 I do find the simplified presentation of price movements during manias to be an interesting road map, however. We all know that last week cryptos went crazy, with some losing more than half their value. On Friday, and into this weekend, they are beginning to strengthen, and I suspect many crypto-bulls have heaved a sigh of relief and are comforted by the fact this was just another one of those scary downturns. They don’t say HODL for nothing, you know. Preface to all three parts: 2017 has been an exciting year for Slope, and I went looking among the literally thousands of posts this year to find what I considered the most intriguing. I earmarked twenty-one of them, and since that is too much for a single post, I’ve broken them into three equal parts. Here, then, are seven of my favorite posts from the year and a few words about each one. Thank you, Slopers, for making this place thrive for so many years. The Virgin Suicides – Even while vacationing on a tropical paradise, I get contemplative and morose. EZ Disaster Guide – How come the mayhem predicted on ZeroHedge never works out? Read this and find out why! Is the Difference Permanent? – In which I consider whether the permanent “Central Banker Put” and the extinction of bear markets might be permanent or not. God Is Dead – Why has hubris stopped being punished, as in the days of old? Elliott Wave’s Last Stand – Here I give our friends in Gainesville one last chance to redeem themselves. I’ll mention, as an aside, that their “highest levels’ for the market have been exceeded. Again. Special No More – Oh, my. Another one of these navel-gazing things. I guess 2017 was tough on Tim. Quixey Makes Sense Now – Is a well-funded startup guaranteed to survive? Nope. And, as a final bonus, I present to you this post – Bitcoin’s Bullish Base. It isn’t beautifully written like the other twenty-one posts I’ve mentioned in these retrospectives, but it’s definitely the best trading idea I’ve ever had in Slope’s history. Here’s to a better 2018!